Have you ever carved up a leg of lamb with a blunt knife? Shaved with a blunt razor blade? Whittled a piece of wood with a blunt pocket knife? I bet you didn't think it was a great experience eh? And neither is using a chainsaw with a blunt chain. At best, the job takes longer and is hard work. A blunt chain can wear and cause damage to your bar. At worst. a blunt chainsaw can get stuck in the wood or get a nick, fly off and hit your hand. At the very least, you've got downtime. That might be fine if you're a weekend warrior with time to burn, but if you've got get that job done before knock-off time, you need a sharp machine. The maintenance of your chainsaw is so important and a keen part of that good practice is knowing how to sharpen your chain. In theory, it's a relatively simple task but you've got to apply the principles of it well. The short version of this is that each bit should be sharpened as evenly as possible. When do I sharpen my chain? Like a cut-throat razor needs to be periodically sharpened, so does the chain of a chainsaw. All saw chains suffer wear and become dull after a period of sustained use. A dull chain increases the chance of a kickback, and we all know, you do not want that to happen. The chain does not pull itself into the cut. You'll know this feeling, it's like a dog pulling on a lead, it just goes. When bucking, a fine sawdust is flying out from the cut rather than coarse, thick chips. You want your saw dust crunchy, not dust like. If it looks like the cut is about to set on fire, even though the chain lubrication is in order and chain tension is correct, you need to sharpen. This is because the blunt chain is causing a fraction too much friction in the cut zone. If you chainsaw "chatters" and "bounces" during the cut, you'll need to check the depth gauge settings and adjust accordingly. Naturally, you may now want to learn how to sharpen a chain! So what tools do you need to sharpen a chainsaw chain? As far as we are concerned, there are two ways to sharpen a chainsaw a) you operate in a fast and loose manner with a file and b) you do the job properly. If you are going with option a) all you need is a saw file that's the correct diameter in size. Your operating manual will tell what you need. If you understand that chainsaw chain maintenance is a really important part of using a chainsaw then option b) is a bit more thought out. A chainsaw sharpening kit which at a minimum includes the correct sized file, a file guide, and a depth gauge tool is a nice to have. 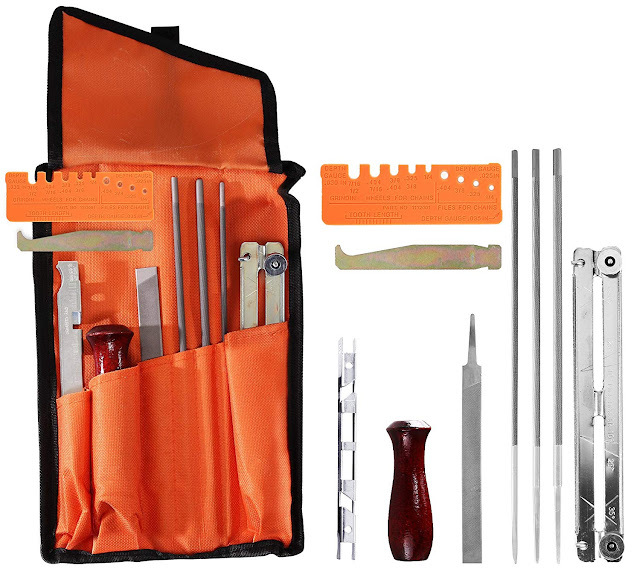 You can find all the tools for sharpening in these handy kits on Amazon . You know how rules often get made because someone does something stupid? The first rule is 'turn your chainsaw off before you sharpen it'! The mind boggles that that has to be the first thing we mention. That said people do juggling with chainsaws that are turned on so go figure... you can actually remove the spark plug cap so the chainsaw ca;t accidentally start. If you are sharpening chain while it is attached to the chainsaw bar (which us usual), make sure it’s tensioned properly as it is hard to sharpen properly if the chain is loose. Clean the oil and grease off. This prevents any build-up on the file’s teeth or the wheel when grinding. Ensure you have your filing tools at the ready - being your file guide (which ensures a consistent filing angle) and your file. Begin sharpening your chain! After two or three strokes of the file, check how much material has been removed. If the surface looks uniform, you are doing it right. Use the same number of strokes with the file with each link of the chain. If you are using your file guide, each stroke will be conducted at the same angle, meaning the chain is consistently sharpened in the same fashion along the whole chain. Only file forwards and never backward. This means you need to lift the file off the chain on the back pull. Can I use a rotary tool to sharpen a chainsaw? You sure can if the attachment is the right size for the chain. A great example of this kind of tool is the Dremel 100-LG Lawn and Garden Rotary Tool Kit. It comes with three sharpening attachments designed for use on lawnmower blades, shears, and of course chainsaws and it rocks along at 35,000 RPM. The Dremel kit includes grinding stones that work best with the attachments as well as cutting wheels for other garden applications so it's win win if you're thinking of buying one. If your chain has managed to gather some rust, you can probably remove it with an acid bath.